Work or Play, Optima has Tomorrow's Battery Today! 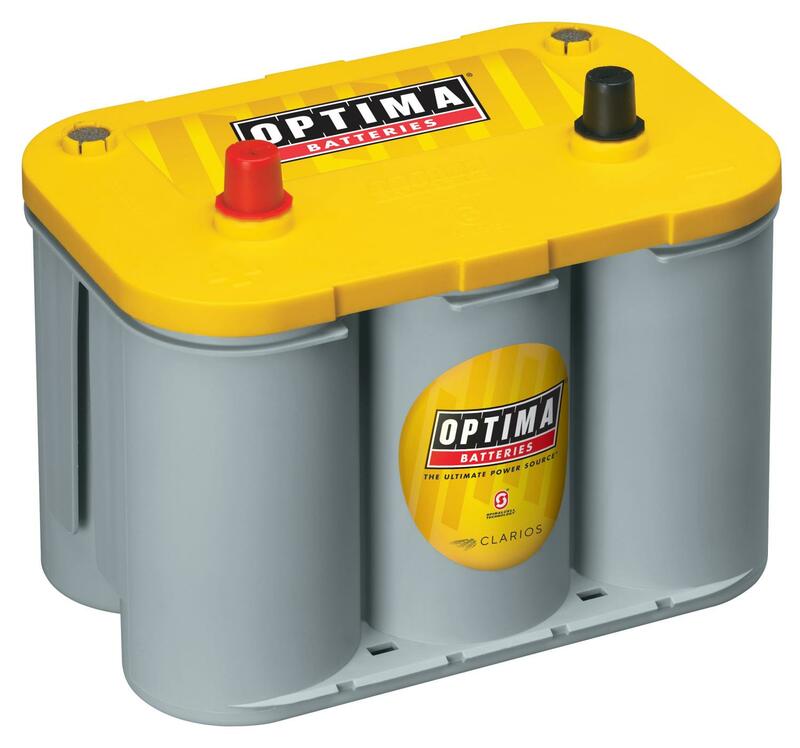 Optima YellowTop Deep-Cycle Racing Batteries provide more powerful, reliable starting than any conventional battery. Their unique Spiralcell design rolls the six cells into a cylinder which keeps the plates covered with acid at all times, creating a battery that endures the roughest vibration and most intense applications... ideal for hard-core racing, off-roading, and off-shore marine. These batteries require zero maintenance, are 100% sealed (out-gassed chemicals are reabsorbed) and install in any position. Tested to provide over 9,000 starts, YellowTops can be stored for up to two years. They are available with top posts or both top and side posts. To securely mount the battery, check out 555-10250 or 555-10255. Looking for a Red Top Battery? Click here. Looking for a Blue Top Battery? Click here. OPTIMA Chargers Digital 400 12V Battery Maintainer and Charger Click here. OPTIMA Chargers Digital 1200 12V Battery Charger Click here. Does Optima Batteries 9012-021 fit your vehicle? Fitment_Note: Check Hood Clearance~Requires Bottom Height Adapter~Requires bottom height adapter check hood clearance. Fitment_Note: Check Hood Clearance~Requires 2 Bottom Snap-In Adapters~Requires 2 Blue Group 65 bottom snap-in adapters check hood clearance. Fitment_Note: Requires bottom height adapter check hood clearance. Fitment_Note: Check Polarity Before Connecting Cables~Requires bottom height adapter check hood clearance. Fitment_Note: Group 78 Puck Adapter Required~Check Terminal Type~Requires bottom height adapter check hood clearance. Fitment_Note: Requires 2 Bottom Snap-In Adapters~Requires 2 Blue Group 65 bottom snap-in adapters check hood clearance. Fitment_Note: Height Adapter May Be Required~Check Hood Clearance~Requires bottom height adapter check hood clearance. Fitment_Note: Check Hood Clearance~Requires 2 Bottom Snap-In Adapters~Auxiliary Battery Group 50~Requires 2 Blue Group 65 bottom snap-in adapters check hood clearance. Fitment_Note: Requires 2 Blue Group 65 bottom snap-in adapters check hood clearance. Fitment_Note: Height Adapter May Be Required~Check Hood Clearance~Requires 2 Blue Group 65 bottom snap-in adapters check hood clearance. Fitment_Note: Height Adapter May Be Required~Check Hood Clearance~Cold Climate~Requires bottom height adapter check hood clearance. Fitment_Note: Height Adapter May Be Required~Cold Climate~Requires bottom height adapter check hood clearance. 9012-021 is rated 5.0 out of 5 by 2. Rated 5 out of 5 by Sick_Klownin from Very strong battery! I love this battery and highly recommend anyone to purchase an optima battery if you're a racer. Red or yellow top depending on the application are both great! is this battery made in USA? These are manufactured in Mexico.